Product categories of Ethernet Switch, we are specialized manufacturers from China, Network Switch, POE Switch suppliers/factory, wholesale high-quality products of Gigabit Switch R & D and manufacturing, we have the perfect after-sales service and technical support. Look forward to your cooperation! N-NET offer fast Ethernet (10/100M) and Gigabit (10/100/1000M) Ethernet Switches with Managed and Unmanaged style for higher bandwidth, reliability, interoperability and scalability. N-NET Ethernet switches support auto-sense of MDI/MDI-X, facilitating system commissioning and installation. 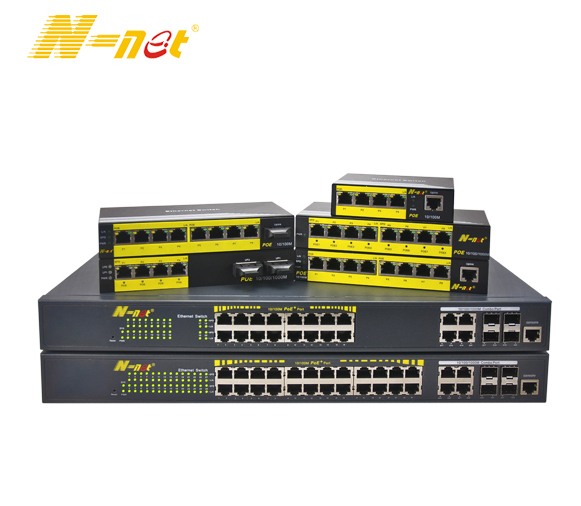 N-NET has over 200 models Options in single mode in dual fiber, multi-mode in dual fiber, and single mode in single fiber. Low power consumption, reliable and stable performance.